Just as last year Genoa has lost the first match of the season. After 0-3 last season against Milan, this time 1-0 in Sicily against Catania. The goal was scored in the 63rd minute by Giuseppe Mascara who played with Genoa in the season 2002-2003. Also in the season 2004-2005 in Serie B Mascara scored an important goal against us in the last minute of the match Perugia-Genoa: 2-2. 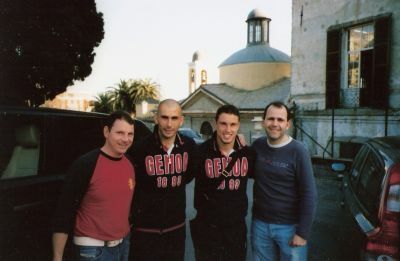 Genoa started with Anthony Vanden Borre and Juric as central midfielders, assisted by Marco Rossi (right) and Francesco Modesto (left). In the first 15 minutes Catania started, as expected, very agressive but after this period Genoa controlled the match and had some little chances to score in the oven of Catania. 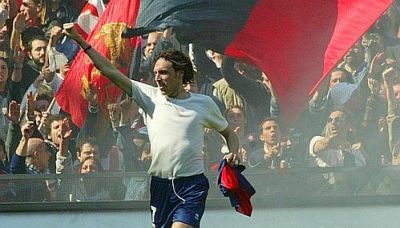 In the best part of the match of Genoa the goal of Giuseppe Mascara was scored. Of course Genoa did everything to score the equalizer, but we did not succeed. 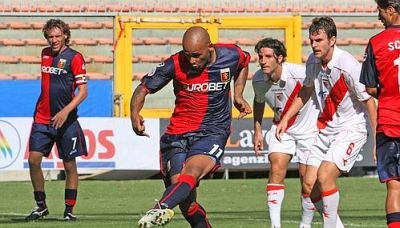 In the 3rd round of Coppa Italia Genoa has beaten Mantova by 3-1. 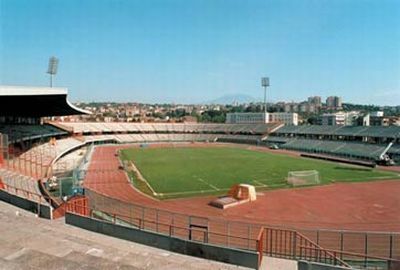 In the next round on 18th September and 2nd October Genoa plays against Ravenna (Serie C-1) that surprised in Palermo yesterday. Mr. Gasperini started with the following team: Rubinho; Biava, Ferrari, Criscito; Mesto, Rossi, Juric, Modesto; Sculli, Olivera, Gasbarroni. It lasted only 19 minutes till Olivera scored the first official Genoa-goal of the season. In the 43rd minute again Olivera doubled the score: 2-0 at halftime. The match with 8.577 spectators was decided by Mesto’s substitute: Omar Milanetto, who beat goalkeeper Handanovic for the 3rd time in the 76th minute. In the last 15 minutes also Palladino and Figueroa came into the field to substitute Sculli and Olivera. The last goal was scored with a free-kick by Passoni in the 87th minute: 3-1. Genoa qualified for the 1/16 finals against Ravenna. Goodbye Marco di Vaio, succes in Bologna ! After Manuel Coppola last January, now also Marco di Vaio has left Genoa. Two great players from Rome, that always gave us a feeling of homecoming if we visited the Pegli-trainingfield. Both friends brought Genoa back in Serie A as line-up players in the Serie B season 2006-2007, but did not get much playtime in Serie A with Genoa. As a modern footballplayer you go from club to club, trying to win and earn as much as possible in 15 years. Of course Manuel and Marco are right to leave Genoa and of course Mr. Gasperini is right that he always wants to play with the best team, but it is a pity that especially these 2 friendly players leave. Manuel and Marco lots of succes in the rest of your career, we hope you will have lots of succes, except in the matches against Genoa of course. 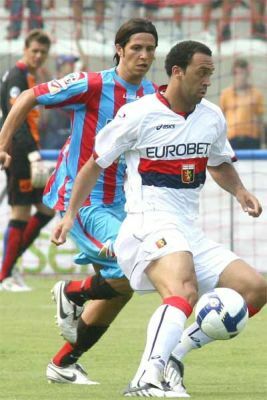 In the season 2006-2007 Genoa played in Serie B and Lucho again was operated in October 2006 because the knee reconstruction in March had not been completely successful and further surgery was nescessary. All of this meant that Figueroa did not play a single minute that season. After the promotion to Serie A in the summer of 2007 also Lucho came back to the top. In the homematch against Fiorentina on 28th October 2007 he made his debut, substituting Marco Borriello and a few weeks later on 9th December 2007 he scored his first Genoa-goal in Luigi Ferraris against Siena. In the season 2007-2008 Lucho played a total of 796 minutes in Serie A and scored 3 times (besides Siena, also at home against Atalanta and in Palermo). Besides his heavy injury (and probably the dead of his brother), Lucho is also loved by the Genoa-fans because he is always incredibly friendly. We all hope the season 2008-2009 will be his season, so everybody was in shock the last weeks when the newspapers told day after day that Figueroa would be sold if he did not return immediately at the top. Lucho was under high pressure and so far he only scored once against Acqui Terme and a penalty against AZ Alkmaar, while his concurrent Olivera already scored 11 goals. The newspapers said that tonight would be his exame and Lucho graduated being the best student of the school. After the first goal of Gasbarroni, Figueroa scored the 2nd (overhead kick), 3rd (penalty) and 4th (header) goal, while he also hit the post in the 89th minute after which Potenza could score easily the final 5-1 against Albese. Mr. Gasperini and the supporters always kept the faith in Lucho and in a few weeks the whole world knows why ! Forza Genoa, Forza Lucho ! After his heavy injury in the match against Napoli last February probably tomorrow Matteo Paro plays his first friendly-match with Genoa against Albese (Serie D). The young talented midfielder was missed over 6 months because of the operation of his left knee. A few days before the start of the season it looks like our captain Marco Rossi has lost his position in the line-up. Last season our ex-Genoano of the year formed the perfect couple with Abdoulay Konko who now plays with Sevilla in Spain. Against AZ Alkmaar Potenza and Mesto played at the right-side of the field keeping Marco Rossi on the bench. In the newspapers the last days was written that Marco, who enlarged only 3 weeks ago his contract till the summer of 2011, is wanted by several other teams in the Serie A, but the club ignored the rumours immediately. Marco Rossi is not for sale (we hope just as Lucho Figueroa who has to score the next matches to stay with Genoa). Yesterday in the quarterfinals of the Olympic games in China 3 Genoani played against each other: defenders Domenico Criscito and Salvatore Bocchetti with Italy against Anthony Vanden Borre of Belgium. 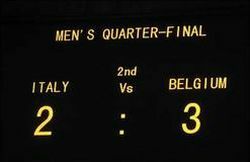 Till this match the Italian defence with the 2 Genoani together in the center was unbeaten, but today Belgium scored 3 times. Best man in the field was the striker of AZ Alkmaar: Moussa Dembélé with 2 goals. Criscito and Bocchetti now go back to Italy to play with Mr. Gasperini and the rest of the team next Sunday at 16.00 hours in Luigi Ferraris the 1st match in the Coppa Italia against Mantova or Gallipoli. Vanden Borre plays Tuesday in the semifinals against Nigeria.